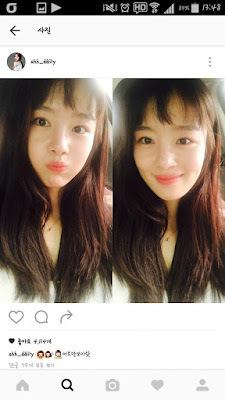 Netizens feel like Sunhwa is trying to copy Sulli? -Who in the world said that? I've never seen anyone said something like that before..
-So prettyㅠㅠ But where did all this fuss come from? -? And the reason is..? -It's my first time hearing itㅋㅋㅋ In what kind of aspect is she trying to copy Sulli? -Maybe it's because her bangs in the first picture.. And I have no idea for the second one..
-Will you get labeled as Sulli's Knock-Off if you cut your bangs like that..
-Is it just because her bangs and the fruit she's holding in the second picture? -I don't think she's trying to copy Sulli.. She's just.. pretty..
-It's probably because of their similar vibes..? I don't think those picture was intentional..
-What the.. Does that mean everyone who takes pictures while holding up a fruit is trying to copy Sulli? -I don't know what is Sunhwa trying to copy based on these pictures..
-I can't see anything but the fact that she's pretty..